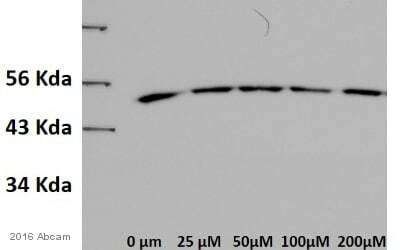 The antibody detects endogenous level of total p53 protein. Synthetic peptide corresponding to Human p53 aa 13-17 conjugated to keyhole limpet haemocyanin. ZR751 nuclear extract lysate (ab14916) can be used as a positive control in WB. MDA and JK cell extracts; HeLa cells; Human breast carcinoma tissue. Rat breast and colon tissue lysates; Rat breast and colon tissue. Antibodies were purified by affinity-chromatography using epitope-specific peptide. Our Abpromise guarantee covers the use of ab131442 in the following tested applications. WB 1/500 - 1/1000. Predicted molecular weight: 53 kDa.Can be blocked with Recombinant Human p53R2 protein (ab153320) or Recombinant Human p53 protein (ab43615) or Recombinant Human p53 protein (ab84768). Lanes 1 - 4: Merged signal (red and green). Green - ab131442 observed at 53 kDa. Red - loading control, ab8245, observed at 37 kDa. Wild-type and p53 knockout samples were subjected to SDS-PAGE. ab131442 and ab8245 (Mouse anti-GAPDH loading control) were incubated overnight at 4°C at 1/1000 dilution and 1/20000 dilution respectively. Blots were developed with Goat anti-Rabbit IgG H&L (IRDye® 800CW) preabsorbed ab216773 and Goat anti-Mouse IgG H&L (IRDye® 680RD) preabsorbed ab216776 secondary antibodies at 1/20000 dilution for 1 hour at room temperature before imaging. Other recommended antibodies to this target are ab32389 and ab26. Immunohistochemical analysis of rat colon tissue sections with ab131442 at 1/150 dilution.The tissue was formaldehyde fixed and a heat mediated antigen retrieval step in citrate buffer was performed. The tissue was then blocked and incubated with the antibody for one night at 4oC. A goat Anti-Rabbit IgG H&L (HRP) at 1/200 was used as secondary. ab131442 staining p53 in formalin -fixed, paraffin embedded Rat C6 cells by ICC/IF (Immunocytochemistry/Immunofluorescence). Samples were incubated with primary antibody at 1/100 dilution. A goat anti-rabbit IgG H&L (1/50 dilution) was used as the secondary antibody. 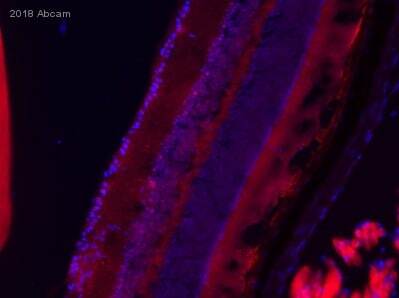 Immunohistochemical analysis of rat breast tissue sections with ab131442 at 1/150 dilution. The tissue was formaldehyde fixed and a heat mediated antigen retrieval step in citrate buffer was performed. The tissue was then blocked and incubated with the antibody for one night at 4oC. A goat Anti-Rabbit IgG H&L (HRP) at 1/200 was used as secondary. Immunohistochemical analysis of formalin-fixed, paraffin-embedded rat breast tissue with ab131442 at 1/100 dilution. A Goat Anti-Rabbit IgG H&L (CY3) at 1/50 was used as secondary. ChiP analysis of ab131442 in 293T cells at a dilution of 1:50. Immunohistochemical analysis of paraffin-embedded Human breast carcinoma tissue labelling p53 with ab131442 at 1/50 dilution. Right panel was preincubated with blocking peptide. Immunofluorescent analysis of methanol-fixed HeLa cells staining p53 with ab131442 at 1/100 dilution. Publishing research using ab131442? Please let us know so that we can cite the reference in this datasheet.